He felt the usual sharp burst of pain as his memory was injected into his new body. 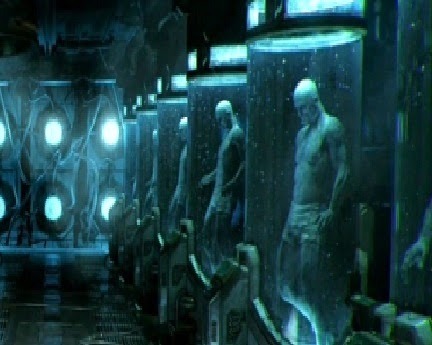 Bio fluid drained out the bottom of the clone chamber as it gently opened, spilling his body out on the floor. Nashh Kadavr had died many times but only enjoyed it, if done by his own choice. Getting 'Santo'd' was not a choice. The clone facilities seemed eerily quiet, they usually where in this station. Many pilots lost their lives in this part of low-sec but not many had clones installed at Ishomilken 4-2. As his vision turned less blurry and strength returned to his muscles he attempted to stand. Using the lockers opposite his clone vat to steady himself, he became acutely aware he was not alone. Blurred peripheral vision outlined her body, no mistake about it; it was her. Despite motor skills still recovering from his sudden re-birth he managed to open his locker with one hand to grab a blaster from the middle shelf. Keeping weapons in unusual places had proven to be valuable in the past. 'You ok?' She spoke softly. Nashh and Venom shared a past, some bad, mostly good. There had been many times she had to bail him out of situations he had created. Something didn't add up... He released his grip on the pistol and picked up a towel instead, using it to cover whatever modesty he had left. Vision returned to normal and he had no shame familiarising his eyes to her curves and perk shape. Memories flooded back to some of the crazy nights they had spend in years gone by. She was just like he remembered.